If you handle sensitive documents or cash in the business world, you can protect them using a drop safe. Sometimes referred to as “deposit safes,” drop safes allow one party to drop documentation or cash inside and another party to remove it. Drop safes make it easier to ensure security between personnel and departments and to keep track of who has handled what. As there are a variety of different types of drop safes with varying configurations and features, it can take some time to research and identify the most suitable one for your workplace. Below, we have compiled a comparison table of the best drop safes available on the market right now based on ratings, features and customer satisfaction. Check out our buying guide below to acquaint yourself with important features, considerations and questions to ask while shopping for a drop safe. 1. What is the purpose of your drop safe? Will you be depositing cash in your drop safe? Money orders and checks? Other forms of sensitive documentation? Packages? What are the largest package dimensions you can picture the safe being used for? These considerations will influence the loading configuration you go with (see the relevant section below under Considerations). 2. Where will you locate your drop safe? This is also an important consideration where configuration is concerned. Drop safes are frequently located inside walls, where deposits are made in one room and received in an adjoining room. But sometimes drop safes are simply anchored to the floor. Portable models exist as well. 3. Who will be using the safe? This is another vital question to ask yourself when you are choosing a drop safe. Which departments are going to be using the safe? Do the different departments have different security levels? What about the personnel within those departments? Are there regular staff changes? You need to decide whether you want a front-loading, top-loading, or rear-loading model. You can also shop for small drop safes, double door drop safes, or drop safes with interior lockers. Each of these subcategories has its pros and cons and is ideal for different purposes. For cash or envelopes, front-loading safes work great. Top-loading or rear-loading safes also work for this purpose. For installation between two rooms, get a rear-loading safe. As the name implies, an employee in one room is able to load the safe with cash or documents through the back end. An employee on the receiving side can open the safe and remove the contents. Top-loading safes work well for larger items. You also might consider a top-loading safe if you want an extra level of security. Often these safes are more ruggedly designed. Small drop boxes are a good option if you will need to move the safe around on a regular basis. Need to provide two levels of employee access inside a single drop safe? Choose a double door drop safe. The interior is divided into two separate compartments, and there is a door for each. Alternately, you can try a drop safe with an interior locker. Assuming you have a reasonable degree of trust in the employees who will be utilizing the drop safe (and you should), you may want to consult with them. You have your own ideas about what type of safe will be best, but they may be better versed in their daily duties and have some valuable input on what would be most secure and convenient. Taking that input into account will boost efficiency and also facilitate cooperation throughout your organization. As with any other type of safe, a robust design featuring thick solid steel is important. If the hinges are concealed, all the better. Look for an industry rating which demonstrates that the deposit safe can stand up to hand and tool attacks. Generally, the appearance of a safe may not be something you concern yourself with all that much, at least in a residential setting. In a business setting however, you want everything to fit in with your professional décor. Choose a safe which has a nice finish and which will be a match for your workplace environment. A lot of drop safes get used multiple times a day, every single day, often by employees who are in a rush to get to their next task or head home for the day. The safe you choose should be one which emphasizes ease-of-use. That way employees can make their deposits quickly and conveniently and get on with what they need to do next. If they can use the safe efficiently and with minimal effort, they are less likely to compromise security protocols. Finally, you will need to decide what type of lock you want for your drop safe. For this too, you may want to ask around for employee preferences. If most of your employees favor keypad locks and cannot stand combination locks, it makes no sense to force them to use a combination lock. Think about access profiles as well. This goes back to figuring out which personnel need to use the drop safe. You may want to have separate codes for each department, or you may want to further subdivide and set up a code for each individual employee. Fingerprints can work just as well for this—better, actually. Any employee can share a keypad code, but faking a fingerprint is not so simple. With separate access profiles, you have superior control. You can activate, deactivate, and replace codes as needed. You also can track which employees have accessed the safe. If you have regular staff changes (for seasonal jobs, for example), choose a safe which lets you change access codes as many times as you want. Backup keys are a good feature too. If an employee deletes or replaces access codes on mistake, you can use the backup key to get into the safe. Customers who are in search of a great drop safe at a reasonable price point will want to think about the Barska AX12588. This depository keypad safe is quite sturdy and offers an array of features to enhance security and convenience in any workplace. The outer dimensions for the standard model are 14in x 14in x 20in, while the inner dimensions are 13.5in x 11in x 12in. There is also a larger version available. Use up to two pin codes. You can set up the safe to use two pin codes. If you only require a couple of levels of access for your workplace, this may be perfect for your needs. What is really cool is that there is even a feature which you can set up to demand the input of both the codes at the same time. This means that you can set up your safe so that it can only be opened when two people are present. A set of backup keys is included. When you order this safe, it comes with a set of two keys as a backup. If the codes are reset on mistake or you forget them, you can get in and access your valuables. Lock-out mode included. Should an unauthorized user attempt to gain access to the safe, he or she will only be able to enter in the incorrect code three times in a row. On the third wrong try, lockout mode is initialized. The intruder must then wait for 15 minutes before trying to enter in another code. By then, hopefully you or someone you trust will have had a chance to intervene. The safe represents an excellent value for the price. While this is not the heaviest or sturdiest safe on the market, it is quite strong for the price, making it a great value. A few models may have a fault. Some buyers have mentioned that their safe did not lock properly. This appears to be a fault affecting only a small percentage of units. For a solid drop safe featuring a frontloading hopper, consider the Mesa Safe MFL3020EE. This deposit safe has a layout which is a lot like that of a mail box, making it intuitive and easy to use. The electronic keypad lock is battery-operated and the relocking device is spring-loaded for superior performance. The outer dimensions of the MFL3020EE are 20 in. L x 20 in. W x 30 in, and the inner dimensions are 17.25 in. L x 19.5 in. W x 7 in. H.
This safe includes an anti-fish baffle. This feature stops an intruder from using the deposit door to access the contents of the safe when it is closed and locked. 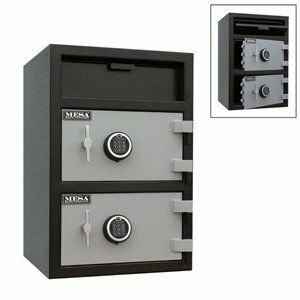 The Mesa MFL3020EE depository safe is sturdy and solid. The walls are made of 12-gauge steel and the door is half an inch thick. You can input multiple codes as needed. You can store as many as five user codes at any one time. You can set up the safe so that it can be opened with one code and a single user present, or you can set it to open only if two codes are input in combination, requiring two people to be present. There is an override key provided. You do not need to worry about locking yourself permanently out of the safe. If something goes wrong with the access codes, use the provided backup key. Some units may ship with parts missing. There are reports that some units may arrive without all their parts. This is not common. Those who are searching for a superior drop safe with advanced security features and solid design and construction may be interested in the Stealth BWB3020FL12. 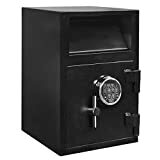 This safe costs around triple what many competing drop safes do, but it justifies its price through quality materials and design. The safe features solid steel construction. 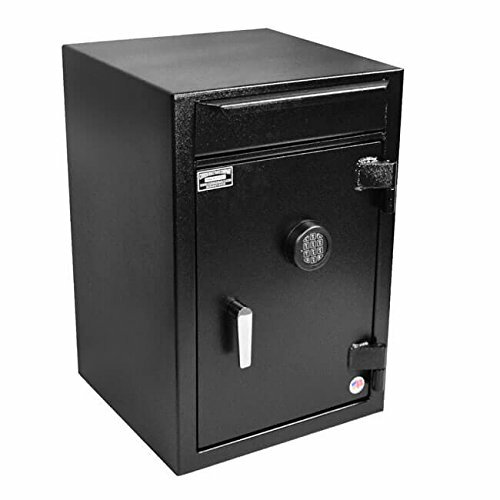 Weighing around 210 pounds, the BWB3020FL12 is made of much heavier steel than many other drop safes. As such, it is a great option for those looking for some extra security. You can anchor the safe if you wish. 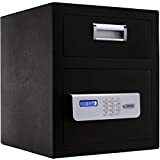 Your purchase of this safe includes four concrete wedge anchors which you can use to prevent an intruder from running off with the BWB3020FL12 and the valuables it contains (the 210 pound weight is also a major deterrent). This unit includes an adjustable shelf. If you wish to reconfigure the interior space to better fit your valuables, you can do so. The lock is UL-approved. Unlike a lot of other drop safes, this one features an electronic lock which is UL Approved (Type 1). The safe is backed by a 5-year warranty. 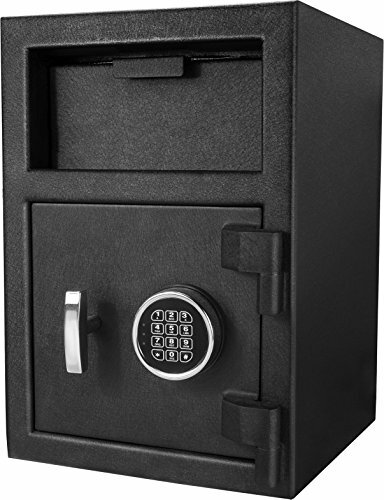 This safe is manufactured in the USA and is guaranteed through a 5-year warranty. This is a high-end drop safe. Being as this is a more expensive model, it may not be the ideal deposit safe for all businesses or situations.